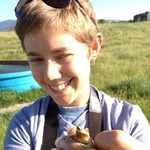 I'm currently a 3rd year graduate student at UC Davis, studying issues in amphibian conservation and invasion ecology. I've worked in aquatic systems from pond turtle population dynamics to the food chains of dragonfly larvae, and loved every minute of it. If you want to know more about the project, California Red-Legged frogs or amphibians in general, freshwater aquatic ecology, or conservation biology, email me at rbanderson@ucdavis.edu!